Allison, gorgeous room. Would you be willing to share wall color? My suggestions to you would be to purchase pillows that pull colors from your rug. The pillows should also have visual interest as in prints or images. Maybe step up the colors in the pillows but are in keeping with the rug colors. Also you need a coffee table. I would go with glass top and iron legs. I've purchased inexpensive coffee tables from ikea, ballard and the like. I love this rug. Is it antique? can you share resource? Is it available for sale? 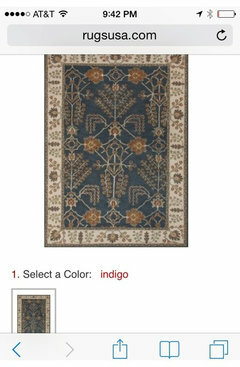 Rug - Can you please tell me the source for this rug? It looks like the rug is a one of a kind custom rug. If you like the design we can do custom rugs at very affordable prices. Where is coffee table from? You made my day with your comment about the timeless coffee table. My husband and I bought this same table between 1989-1992 in NJ and have LOVED it in three different homes. What is the name and brand of the rug? Thank you for your question, this project has been filed. Rugknots, did you provide the rug for this project? Bowl - Where did you get the wood bowl from? What size is it? @manorieg We use to sell these when we had our shop (imported) and called them dough bowls. There is a business (not affiliated with it in any way) that has them (albeit may be sold out) called https://www.greatstuffbypaul.com/product_results.asp?source=srch. Love the glass bottle. Where can I purchase it? These glass bottles, otherwise known as Demijohns can be found all over, retails stores and on the internet. Good luck! I love the color of the couch; is that a custom fabric, or by any chance was that purchased retail? The sofa is from Lee Industries: 3700-03, I do not have on file which fabric that was selected. You are wonderful to reply! Thank you! The Blue Heron pillow can be purchased from Deluxepillows.com. Sorry for the delay, I was not notified that I was being asked your question. It is from trade source called China Wind. What is the gorgeous paint on the wall (Manufacturer and color)? Really great room! Give Sherwin Williams' Sequin, SW6394 or Napery SW6386. See Benjamin Moore’s Twilight Gold #1069. It's very similar. Table - Where can the coffee table be purchased, please. The coffee table is Huntingdon Forge, I am not sure if they make this design any more. Does the carpet come in a runner about 2.6'x 6'? - Does the carpet come in a runner 2.6' x 6' ? Unfortunately no, this is a one of a kind rug. Pillows - Hi! Where are the pillows from? Thank you! Good luck with your project, this project is a few years old and the information is not longer accessible. No question - I just want to compliment you on an absolutely exquisite room. I wish it were in my home! Depends on what you are referring to. It is a personal preference but general rule of thumb 36-40" off the island. artwork - I love the artwork. Whose work is it and where can I purchase? Thank you for your question. The art work is a collection that my client had been collecting over the years of Japanese wood block prints. Unfortunately because they are antiques they can not be purchased at stock. Good luck with your project. Start with one oriental rug, add a collection of Japanese prints, then top with a European demijohn bottle: a recipe for subtle global success. Use one interesting piece as a jumping off point. 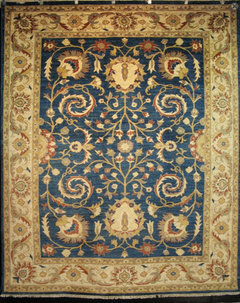 The Persian rug is the foundation of this collected room. 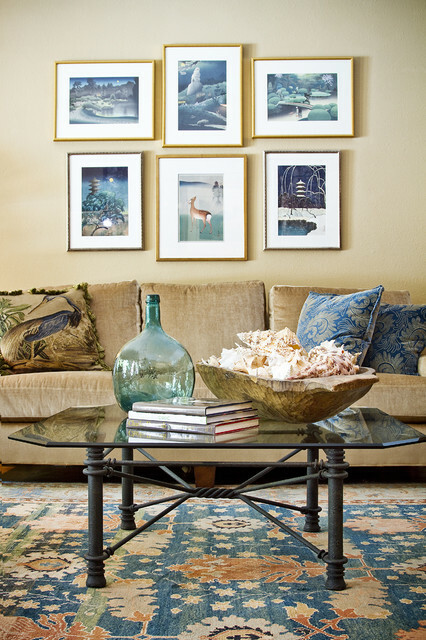 Matching mats and frames unite the artwork on the wall, rich colors pulled from the rug adorn the sofa and walls, patterned pillows add variety, and objects like an antique glass bottle and a wooden bowl full of shells add texture. Are you a shell collector? Corral your marine-inspired medley in a display to enjoy even if a getaway is not in your near future. Perhaps the most collected summer souvenir is the shell. I like to collect my shells in a bowl for display, similar to the living room here. It's a great way to casually display your pieces and have the flexibility to add to it with each vacation. 1. Keep patterns in the same color family. You can’t go wrong with visual echoes, as this living space testifies, and this strategy is an effective way to fold a series of patterns into a pleasing package. Layers of blue tie a busy Oriental rug together with patterned pillows and a grid of artwork.